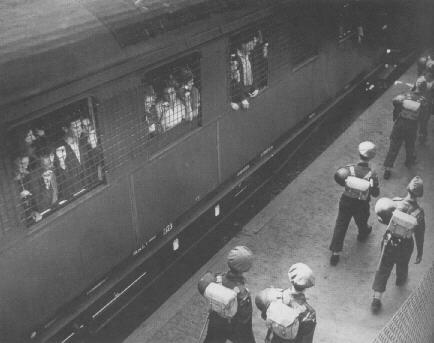 Another Sealed Train – British troops guard a train-load of Jews at Hamburg docks in 1947. The British authorities were attempting to enforce their mandate by limiting Jewish immigration to Palestine, in the interests of the indigenous population. These Jews had been refused entry and were en route to a camp at Poppendorf.Wherever they go, whoever they deal with, Jews cause discord and disaster. The first two raids, on 30 March 2005 and 12 April 2006, were by Humberside Police. These were inspired by complaints from Jews, one a “Professor of Human Rights” at LSE (the quote marks are ironic) and several individuals at the Blackpool Reform Synagogue. Two unknown people had foolishly posted and hand-delivered copies of Tales of The Holohoax to them. A large amount of Heretical Press book stock, computers and other private papers were impounded. The prosecution was authorised by another Jew, Lord Goldsmith, and it was revealed in court that at least one of the complainants had been in touch with him personally. During a third raid which took place on 4 July 2007, North Yorkshire Police illegally seized over £10,000-worth of publishing equipment on the basis of a single complaint from a Jewess who had objected to the distribution of the Don’t Be Sheeple free newspaper. Despite being illegally seized, Judge Grant later ordered the publishing equipment to be confiscated. Another Jew, Dan Cohn-Sherbok, was called as a prosecution witness. He is the author of a book with the revealing title Holocaust Theology but for some reason there was no cross-examination on the (normally covert) religious basis of the Holocaust. He was terrified that Sheppard and Whittle were going to beat him up, right there in the Leeds Crown Court building! The prosecution barrister, Sandiford, acted as if he were on a religious crusade and barracked Sheppard and Whittle relentlessly. He harried incessantly, repeating the same point over and over again in slightly different wording, in attempts to get the answer he wanted. Rather than being appalled by this rudeness and incivility, the jury seemed to be impressed by his professional act of righteous indignation. Sandiford even did the same to our Jewish expert witness who testified over a video link that Jews were a religion and not a race (a legal tactic Sheppard’s barrister had used successfully in the past). It transpired as the first verdicts were read out that the jury had elected the only ethnic member, a Muslim woman, as their foreman. This was evidently their idea of a joke, as they avidly watched for Sheppard and Whittle’s reaction as she stood to deliver the verdict, revealing herself as the foreman for the first time. (She was later discovered following two of our supporters around Leeds town centre, eavesdropping on their conversation.) One intrepid member of the jury held out for several days, but was obviously browbeaten into submission by the others. Of course no-one is suggesting that Jews are anything other than the most wonderful, loving and kind-hearted people, as well as stalwart defenders of free speech.